Relationships after Moyle et al. (2009), Irestedt et al. (2004), and Brumfield et al. (2007). Taxa shown as incertae sedis were not included in any analysis. In contrast to many other suboscine families, Thamnophilidae appears to be monophyletic. However, this cannot be said for many of the genera within it. A good rule of thumb is that the more species a genus has, the more likely it is to be found not to be monophyletic. The first and third largest genera in this family, Myrmotherula and Myrmeciza, are both highly polyphyletic, being divided into at least 2 and 6(!) separate pieces, respectively. The second largest genus, Thamnophilus, still has not had enough species sampled for a proper test of monophyly. Other polyphyletic genera on this tree include Sakesphorus and Percnostola, and other genera may prove not to be monophyletic with further sampling. The genus name always goes with the type species, and other parts of the polyphyletic genera will need other names eventually. Some of these have already been proposed, e.g. Epinecrophylla for two species formerly placed in Myrmotherula. I have adopted a convention to deal with species that have new genus names, or that now need them: the old genus name appears in brackets, after the new genus name if there is one, alone if there isn't. Most remaining lack of resolution in the tree is due to weak support; however, within the tribe Pyriglenini, there are a number of cases in which contradictory relationships are strongly supported by the analyses of Moyle et al. (2009) and Brumfield et al. (2007); the contradictions are treated here as unresolved. Bates J. M., S. J. Hackett, and J. M. Goerck. 1999. High levels of mitochondrial DNA differentiation in two lineages of antbirds Drymophila and Hypocnemis. Auk 116:1093-1106. Brumfield, R. T., J. G. Tello, Z. A. Cheviron, M. D. Carling, N. Crochet, and K. V. Rosenberg. 2007. Phylogenetic conservatism and antiquity of a tropical specialization: Army-ant-following in the typical antbirds (Thamnophilidae). Molecular Phylogenetics and Evolution 45(1):1-13. Hackett, S. J. and K. V. Rosenberg. 1990. Comparison of phenotypic and genetic differentiation in South American antwrens (Formicariidae). Auk 107:473-489. Irestedt, M., J. Fjeldså, J. A. A. Nylander, and P. G. P. Ericson. 2004. Phylogenetic relationships of typical antbirds (Thamnophilidae) and test of incongruence based on Bayes factors. BMC Evolutionary Biology 4:23. Isler, M. L., P. R. Isler, and B. M. Whitney. 1998. 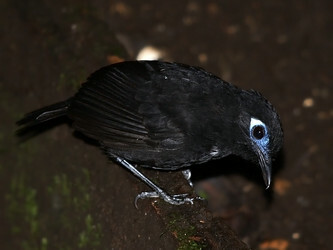 Use of vocalizations to establish species limits in antbirds (Passeriformes: Thamnophilidae). Auk 115:577-590. Isler, M. L., P. R. Isler, and B. M. Whitney. 1999. Species limits in antbirds (Passeriformes: Thamnophilidae): The Myrmotherula complex. Isler, P. R. and B. M. Whitney. 2002. 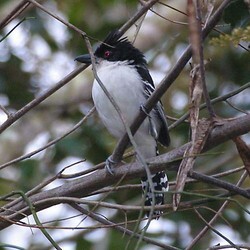 Songs of the Antbirds. Macaulay Library of Natural Sounds, Cornell Laboratory of Ornithology. Ithaca, NY. Moyle, R. G., R. T. Chesser, R. T. Brumfield, J. G. Tello, D. J. Marchese, and J. Cracraft. 2009. 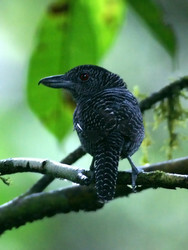 Phylogeny and phylogenetic classification of the antbirds, ovenbirds, woodcreepers, and allies (Aves: Passeriformes: infraorder Furnariides. Cladistics 25:386-405. Ridgely, R. S. and G. Tudor. 1994. The Birds of South America. Volume 2. The Suboscine Passerines. University of Texas, Austin. Skutch, A. F. 1996. Antbirds and Ovenbirds. University of Texas Press, Austin, TX. Zimmer, K.J. and K.J. Isler. 2003. Family Thamnophilidae (typical antibirds). Pages 448–651in Handbook of the Birds of the World. Vol. 8. Broadbills to Tapaculos. J. del Hoyo, A. Elliott, and D. A. Christie, eds. BirdLife International and Lynx Editions, Cambridge, UK and Barcelona. Page: Tree of Life Thamnophilidae. Typical Antbirds. Authored by John Harshman. The TEXT of this page is licensed under the Creative Commons Attribution-NonCommercial License - Version 3.0. Note that images and other media featured on this page are each governed by their own license, and they may or may not be available for reuse. Click on an image or a media link to access the media data window, which provides the relevant licensing information. For the general terms and conditions of ToL material reuse and redistribution, please see the Tree of Life Copyright Policies.